More than 119,107 Corsicans cast their votes in the regional election on 10th of December 2017, in which 63 assembly members were elected. The turnout was 52.5 percent, in the first round 52.1 percent. In the first round of the regional elections, the national alliance list “Pè a Corsica” (For Corsica) was clearly in the lead with 45 percent. In the second and decisive round of the election on the French Mediterranean island, the list won clear with 56.5 percent. Thus, the list reached 41 of the 63 seats. 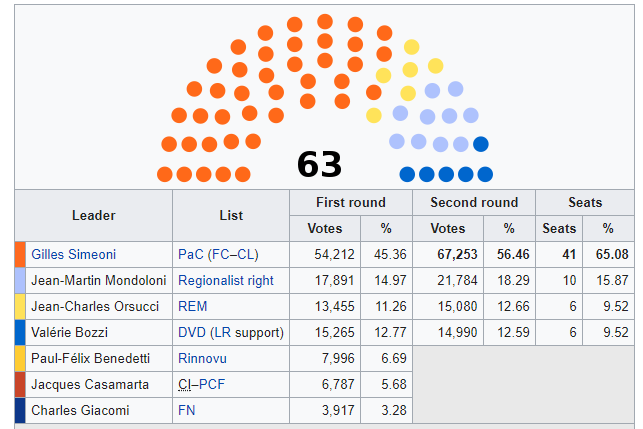 The candidates of the Alliance partiy, Gilles Simeoni (“Femu a Corsica” – Let’s create Corsica), under which the list is run and Jean-Guy Talamoni (“Corsica Libera” – Free Corsica), celebrated their electoral victory on the French Mediterranean island. The nationalist parties are seeking greater autonomy for Corsica, but do not want complete detachment from France. Additionally, they demand equal recognition of the Corsican language in addition to French, recognition of a Corsican residence status in the fight against real estate speculation from abroad, and an amnesty for inmates who they regard as political prisoners.